My lunch today featured a pear and a tomato both from our garden. Yay! Finally, some harvest. 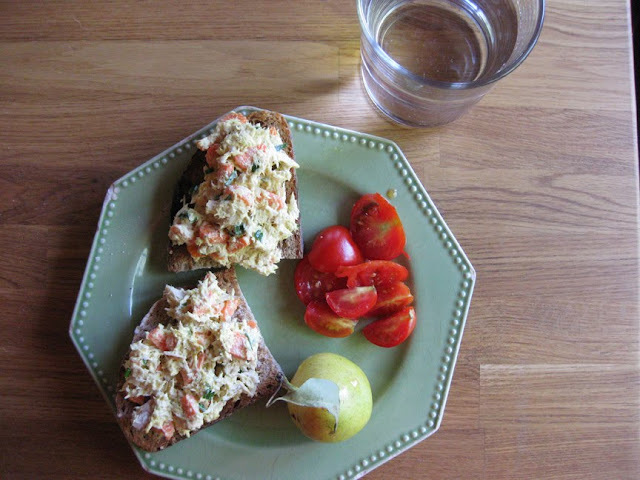 Curried tuna with carrots and tarragon, pear and tomato from the garden. 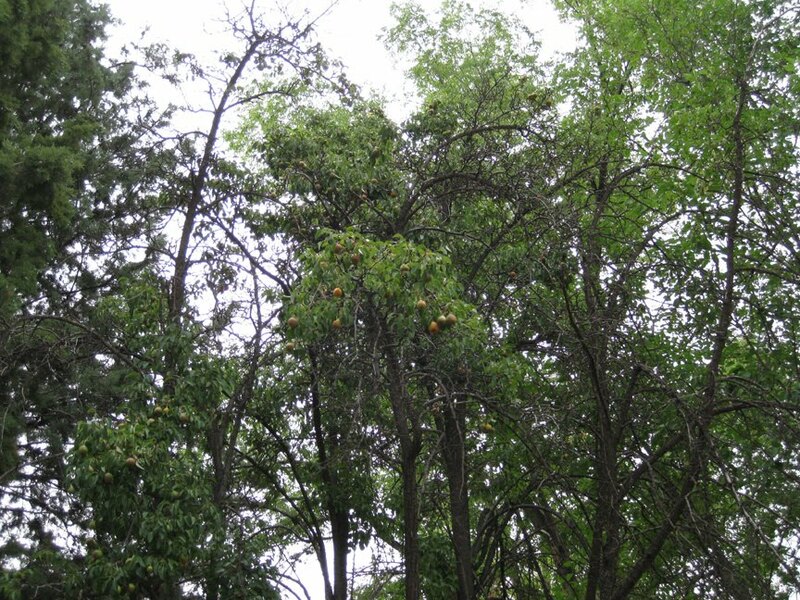 When we bought our property one of the things that we liked about it was the abundance of mature trees. The history is a little fuzzy, but the front house (mom's) was probably built in the 20s or 30s and then added onto in the 50s and 70s. The back house (mine) was built in the early 50s according to a neighbor, and added onto in the 60s and 70s. In the early years someone with a good sense of design and proportion laid out the property with a nice angled driveway that limits visibility from the street. They also planted a lot of trees. Since then many weed trees have sprung up along fencelines and such, and now we have dozens of trees. Unfortunately post-70s the property wasn't very well cared for. I think elderly people lived here, then a woman who got divorced and lived here alone until she set up some trailer hook-ups and rented out trailers. Yeah, weird. Almost two acres though, of county jurisdiction means some strange allowances when it comes to zoning, thus informal trailer park. The post-70s neglect meant that the irrigation system went all to hell and by the time we moved in during the winter of 2001, several of the trees were completely dead and almost all of the others were in need of serious TLC. Some of the big trees that we lost were short lived species, but several were fruit trees. Two big cherries were completely dead, as was one pear. The other pear hadn't been pruned in years but was still alive, probably because it was near a big leak in the irrigation piping. 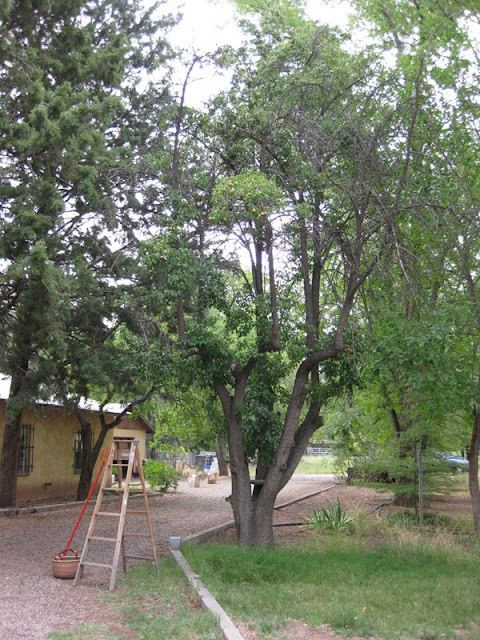 There were also three apple trees which were getting crowded out by a giant mulberry, but were still alive. This post is really about the pear tree though. It's huge, probably 40 feet tall, and with a trunk diameter of 21.5 inches (68 in circumfrence!). Due to its lack of pruning many of the old branches reach for the sky and just to taunt us, that's were the majority of fruit forms. That is until a couple of years ago when some new growth sprouted out just above our heads. After a couple more years we're starting to get more fruit at pickable levels. The pears are small, and we don't spray anything for bugs or to keep away birds, so they tend to have little marks. So tasty when ripe though! The pear tree. The ladder is six feet tall for scale. There is lots of dead growth that needs to be cut out, but we always prune in winter and sometimes can't tell which limbs are dead. You'd think we'd remember to mark them, but we never do. Oh well. Some of the ripe pears out of reach above my head. 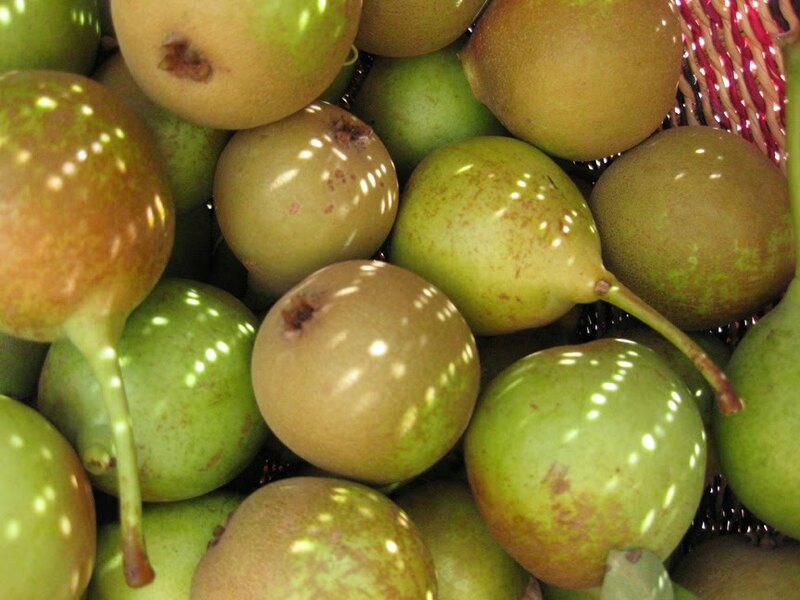 The animals are the biggest recipients of the fruit since the dogs eat fallen pears as desert after their regular meals and as snacks at any point in between. 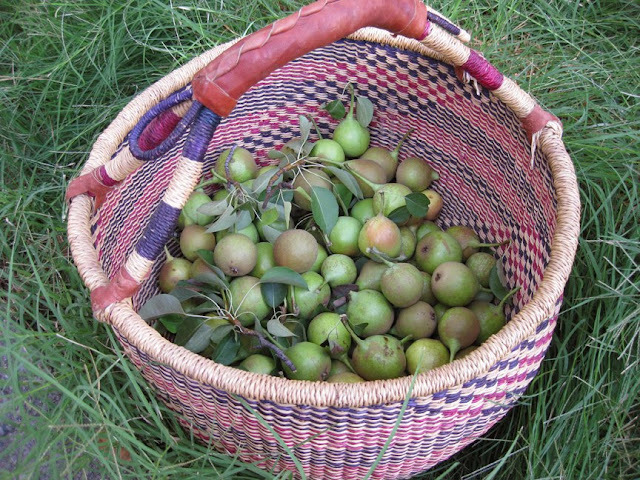 We also gather the fruit in a bucket so that we can take a few pears back to the neighbor's horses when we walk to the back. The dogs help themselves to the fruit in the bucket too. Small pears, but mostly unblemished. A much better representation of their color. What beautiful pears!! I didn't even realize you had a pear tree. That's because it's so huge that it masquerades as an ash tree!